Castle Party is a cyclical event taking place in a small town in Poland. In spite of existing for over twenty years already, it surprises us with something new every year. It may be musical revelation, or unexpected meeting or just dumplings. Some of the people just come here for those revelations, others for those meetings and there are also those who come here for the dumplings. 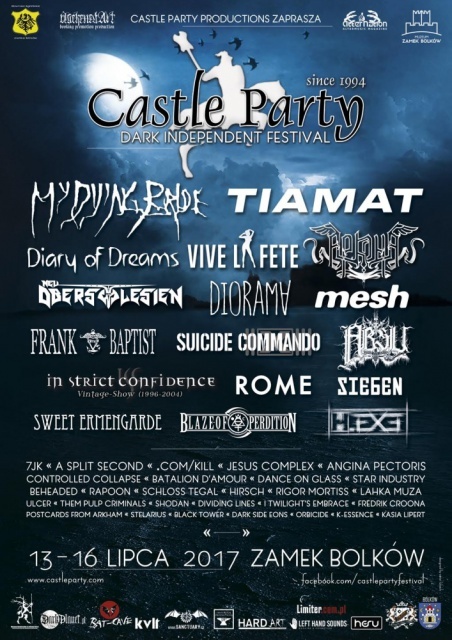 Whatever it is that brings us here, does not change the fact that Castle Party is a musical festival and that is why I am glad to present my own subjective impression of what was happening on the castle’s stage during this year’s edition. Obviously there were also concerts in the former evangelical church. If I ever learn how to teleport, probably then I will be able to write a coverage from two places at once. So far, however, let me concentrate on one stage. It must be said that Thursday was very diversified in terms of music. The church itself had its windows opened therefore it didn’t turn into sauna which definitely made surviving there easier. Nevertheless, even before the festival started, groups and individuals of goths gathered around the church, where they could sit, talk, eat, drink and exchange their speculations about what was yet to come. As the first one to play, Stelarius quite nicely started Thursday’s concerts. A little bit of melody, a little bit of space. Nice beginning anyway. Not the first time at Castle Party, but this time in the church, Lahka Muza presented their performance, visually close to theatre or pantomime, mostly because of choreography and costumes. In terms of music a little bit monotonous. They seemed to try to recreate some mystical ritual. The fans of the band were clearly satisfied, for those who listened for the first time it may have been a little tiring. Dividing Lines is a quite different type of stage energy, something like punk, rebellious, wild, however, in this case it’s a bit too pretty, if you know what I mean. An then we change the atmosphere again because both Belgian Star Industry and German Sweet Ermengarde offered us a travel into the void of gothic rock. Anyway, it hard to imagine a better place for a concert for Frank The Baptist than the church. The preacher could freely teach his lessons from the altar (the stage) and the gathering (audience) could acquire all of the absolute truths carried by guitar riffs. Friday’s concerts on the castle’s stage were started quite energetically by Rigor Mortiss. Soon after them the stage was occupied by Polish Batalion d’Amour. In some of the songs Kasia Lipert played her violin along with the band. Also the band was accompanied by the dancers who literally danced with fire. The band proved great form. Mainly we could hear songs from the new album "Fenix" including the promo single "Charlotte", but some of the older tracks were also present plus a surprise – Depeche Mode cover. For Adrian Hates’ fans Friday must have been a really great day since we could see him on the stage twice. Firstly with his side project .com/kill, which he creates with Gaun:A, and which is defined as dark noise. Not really it is noise, but surely dark. And although it’s not as majestic as Diary of Dreams, Adrian is really convincing in this role as well. Another project on the stage is 7JK, in other words Matt Howden and Maciek Fret. If any instrument can really play apocalyptic sounds, then it surely is the violin. The gentlemen perfectly complement each other and create very interesting musical proposition. Unfortunately, Diorama concert was interrupted by some technical problems. They tried to start several times only to find out that the sound card in Torben’s laptop is broken. Because of that the concert was shorter than planned. In the meantime the band played one of the songs in acoustic version. Fortunately, at least part of the show was saved. Arkona, unquestionable masters of pagan folk metal, is my private surprise of this edition. I don’t listen to such things at home, however, I simply couldn’t stop staring and listening to them. The whole concert was full of some unearthly energy and what is the lady doing with her voice is unbelievable. The audience had a lot of fun and the Slavic melodies enchanted everyone. Very successful performance and recommendable. To close the day, Diary of Dreams created a dark and mystical atmosphere at the castle. The band was promoting their latest album "Grau im Licht" but we could also hear the older songs. They sounded more industrial than during previous concerts in Bolków but in terms of vocal, it is still seducing and penetrating. As usually they didn’t disappoint, it was poetic and reflective. Quoting the announcer (and probably it was his favourite word) it was beautiful. This time without Torben playing the piano, but with Torben as a supporting vocalist in some of the songs. And that was just awesome. On Saturday, the first one to play was Kasia Lipert and already with the very first song – the cover of Carl Orff’s Carmina Burana – she made the whole audience stunned. As a guest vocalist Karolina Andrzejewska (Batalion d’Amour) performed some of the songs. After that there was time for the guitar priest, namely Jesus Complex, who made the audience rock. Of course the castle’s stage cannot miss the masters of guitar, gothic playing. That is why The Angina Pectoris threw a concert in here this year. They came back to life after 15 years with the new album and amazing concert. For the first time in Poland we could hear A Split-Second with their classic set. They changed the atmosphere into much more energetic. They didn’t disappoint the audience which was clearly noticeable. Even more electric and energetic was the performance of Suicide Commando. Since it’s a well-known brand a lot of fans gathered in front of the stage and they had no reason to be disappointed either. The next concert was a Polish element of the festival, Silesian precisely. We’re talking about Neuoberschlesien, which was formed on the basis of Oberschlesien after some break-up in the band and changes in line up. The band is called Polish Rammstein and they threw literally explosive concert with the use of a lot of pyrotechnic effects. Pretty cool to watch and listen, especially because the band write their lyrics in Silesian dialects which along with metal music constitute an interesting curiosity. The star of the evening was long awaited My Dying Bride. They created the atmosphere of melancholy and reflection. After greeting the audience they just smoothly started squeezing the darkness from the souls of the gathering. Their music is not the easiest one to follow, that’s why not everyone feels convinced by it, but surely it is something worth experiencing. Fans must have enjoyed "Sear me" and "The cry of mankind". The concerts on Sunday were started by K-essence. Kind of boyish charm, catchy melodies, a little bit different atmosphere than the whole festival. Probably that’s why not everybody liked it. Dance on Glass, on the other hand, made everyone happy. Ania, despite being nervous, proved her great condition, as well as the rest of the band. Additionally, we could see Beata from Dark Letter as a backing vocal. Apart from the well-known tracks, the band performed also the new ones from the upcoming album. Altogether, just a great concert. Controlled Collapse didn’t disappoint the expectations either. Clear and heavy rhythmical section, pulsating guitar, strong vocal which smashed the audience. Plus absolutely amazing drummer. The next one was Mesh, calming down a little bit with sweetish Depeche Mode style. If someone liked synth pop, they must have had great fun. For the rest, a break for fries. Vive la Fête is another big surprise of the festival. Although some may doubt whether it was a proper band at a right time, but the fact that during the whole concert all of the people (and there were a lot of them) jumped and danced speaks for itself. Great instrumentalists, energetic sound, crazy, frolic vocalist. You could almost think that she was running fitness classes. As it is expected from the main star of the festival, Tiamat gave a wonderful concert and watching them on the castle’s stage was a dream come true for a lot of fans. The setlist included "Cain", "Sleeping Beauty", "Brighter than the Sun". Clearly, the band felt really well on the stage and generally in Poland, which was expressed by Johan openly while joking with the audience. Well, generally he had a great contact with the audience. Plus awesome guitar solos and even better drums. Perfect. We recommend and wait for more. In this way, the next edition of Castle Party festival came to an end. Quickly. Too quickly you may say. But not to be so sad, the following edition will come in less than a year. STAY DARK!